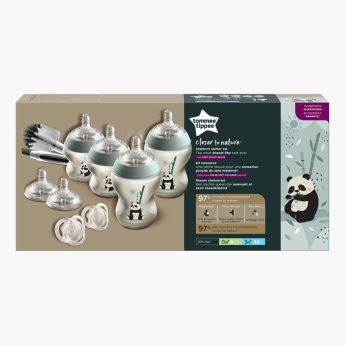 Tommee Tippee Feeding Bottle Set | Pink | Natural feel teat for "just like Mum" feedings. Save AED 38 (25.50%) – Earn 11 Shukrans What is Shukran? Shukran is the Landmark Group’s award-winning loyalty programme in the Middle East, which allows you to earn Shukrans when you shop any of our brands. A lovely gift for any mum to be, this set is sure to make her life easy with your little bundle of joy. 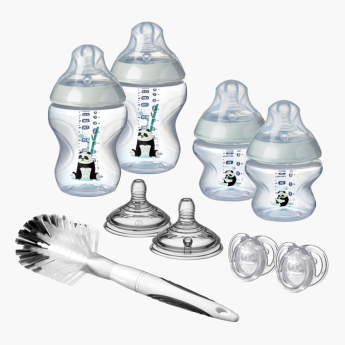 This appealing set comes with four different size feeding bottles, one cleaning brush, and a soother making it a great pick.